The Lounge series may have a vintage look, but it is anything but. Here is a cutting edge, world-beating kit from a UK company that is going places fast. Sister company Keo Percussion debuted this past summer and a clever multi-function practice pad has been created in cahoots with Iron Maiden’s Nicko McBrain. Here, we’ve held off a full kit review until BDC reached the milestone where all of its hardware is unique. “Now that the entire kit is fitted with Palladium hardware, including wing nuts, I feel we have the complete drum kit,” says Keith. Indeed, this is a stage few new companies achieve. And as a first example BDC has sent us a 2018 exotic veneer limited edition of its Lounge kit, which has been evolving since 2015. I know what you’re thinking, ‘That’s a tasty kit, but isn’t it a bit strange with those centre-mounted lugs and elongated tension rods?’ While BDC’s Legend series has conventional single-ended lugs for a more familiar look, the Lounge kit harks back to the 1950/60s of Ludwig’s Club Date and Slingerland’s Stage Band. These kits also had centre lugs, cutting down on the amount of metal cramping the shell while reducing weight for easier transport. And they had fewer lugs per drum. This reduced manufacturing costs, increased portability, and so these kits were marketed as budget level, local club gigging sets. But since the shells we pretty much the same as on the top ranges, some drummers actually preferred playing them. Recently, contemporary drummers have came out of the woodwork, so to speak, admitting a soft spot for these old kits, leading to a revision in the perception of centre-luggers. Ludwig noted this and resurrected its Club Date in 2012, testing the waters with a budget version, then updating to a pro version in 2016. BDC’s Lounge kit bows to this look, but it’s not a budget kit. The everyday version of the Lounge costs slightly less than the Legend, but only for the reason outlined above, ie, slightly reduced hardware. In every other aspect the Lounge is a prime-quality kit. The shells are of the same quality as all BDC shells, there is a full complement of lugs (eight, not six on the floor tom and snare, 10 on the bass drum) and the fittings are of the same excellence as on all BDC kits. Let’s start with the thin 5.5 mm shells, which have eight plies of Scandinavian birch with a single inner ply of mahogany. They are cold pressed: the individual plies are hand-layered, cut and glued inside the moulds then left to cure at room temperature. There is no heat involved and BDC will tell you this is the best way. The outside has a veneer of African etimoe wood, sumptuously finished with a hand rubbed oil. This veneer is sliced from a single log, specially selected by Keough, which has an unusual creamy-yellow sapwood (hence the ‘wild’) running through the warm brown. Thus each kit will be visually slightly different. Individually numbered, the run is limited to just how far the log will stretch - possibly up to 50 kits. Because of the special run this Wild Etimoe Limited Edition is being made in just one size pack: 22"x14", 12"x8", 16"x16" with a matching 14"x61⁄2" snare drum. (The standard Lounge kit is available in BDC’s usual finishes and a range of size options - see website - at a more moderate price). As for that hardware, BDC’s Palladium lug looks pretty close to Ludwig’s 1930s’ designed Imperial lug, which features on Ludwig’s Club Date, making the Lounge even more reminiscent of that illustrious forerunner. The centre lug look is a matter of aesthetic preference. It certainly reduces mass, but the extreme length of the floor tom and bass drum tension rods does leave them more open to bending than normal length rods. The resemblance ends there though. BDC brings the Lounge firmly into the modern era with a couple of nifty tom mounting tweaks. First, the hi-tech floor tom leg brackets, which are held well away from the shell by twin rubber bosses, a system of hard and soft rubber washers. The legs themselves are clamped in a V-shaped memory lock, which docks securely into the main bracket from below creating an isolated lock that cannot twist. This makes the floor tom weighty, while the 12" tom is as light as a feather. It’s recommended to be mounted on a snare drum stand and here BDC excels once more with an idea that is simplicity itself. Dubbed Tom Spring this small plastic unit attaches to three alternate lugs on the bottom of the tom and sits snugly on each of the three snare stand arms, isolating the tom itself from the stand. Tom Springs are made in the UK using the same tough but supple polymer as guitar plectrums. In recent years many drummers - particularly when recording - have realised that drums sporting less metalwork resonate more freely. Thus the vintage Club Dates have come in for a reappraisal. The BDC Lounge embraces that vibe, but is modernised and sturdy enough for contemporary robust playing and touring. 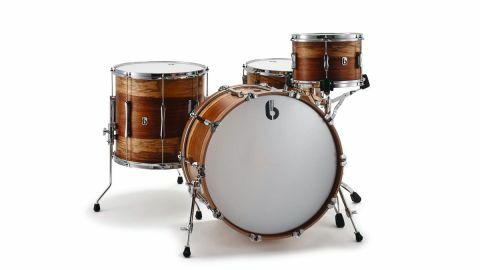 Sound-wise, the drums are in classic sizes and have BDC’s preferred thin birch shells. Birch has that clean, controlled delivery with strong highs and lows. The single ply of mahogany on the inside serves to warm the overwhelmingly birch shell, adding some rich middle to the more edgy birch tone. The bearing edges have a contribution to make too. They have a vintage 30 degree round-over and they straightaway remind me of my 1982 Yamaha 9000’s birch edges. This is the original birch Recording Custom and its edges are remarkably similar, smoothly rounded over. The effect is to slightly ease the edginess from the attack and blend in more of the shell timbre. So, unlike so many modern kits with sharp 45 degree edges there is not quite that biting pinpoint assault. Granted, this latter aggression appeals to many, but the Lounge has more of a mid-vintage type sound with the deeper timbre of mahogany offset by the focused birch. The softer attack of the edge makes the whole kit just that bit warmer and duskier. All the hardware is scrupulously isolated from the shells and with these clean edges and unfettered timber you can tune high and not feel any danger of choking or getting too boxy. In fact, although the tuning range is flexible and down to personal choice, higher tuning rather suits the toms - it helps them project better. The tom clips are a timely invention. Many prefer to use a snare stand rather than fuss around with RIMS-style mounts and with these simple, sturdy but flexible clips, a regular six lug drum automatically plonks onto the three arms of the stand. (Note: they won’t work with a five lug Gretsch or old Premier). The eight lug (not 10) snare drum has symmetrical tuning and although this is still regarded by some as a budget decision, just as many prefer it as it’s balanced and frees the shell even more. Tuning up for a confident high, but not too high, tension brings out the best in the drum in terms of its inherent crispness allied to rich chocolatey warm tone. As per the toms, the tuning range is flexible, but we again opt for this medium-high batter with just a touch of edge damping to take out the excess ring. Here the drum retains its deep flavour of mahogany and birch but is set off by the snap of the extra tension. Poised between the rangey ring of the outer rim shot and the still vibrant but controlled centre strike - where you get the full tone of the drum with a controlled decay - it’s a happy balance. Not the loudest drum, but certainly fulsome in tone.